Posted by Lorea Thomson on Friday, April 14th, 2017 at 5:16pm. Enjoy springtime in Palm Beach County by attending one of the area’s Easter Egg Hunts from Jupiter to Delray Beach. 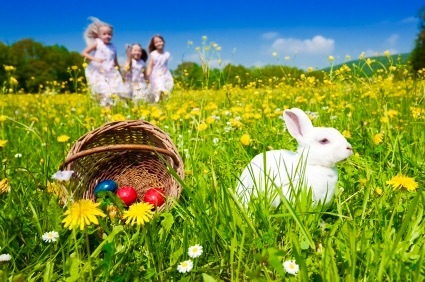 April is an exciting and fun month to celebrate with spring festivals and egg hunts for the entire family. Easter bunnies, colorful baskets and running around for decorated eggs are not the only things planned, there are many other fun family-friendly events to engage in. Details: 9:30 a.m. The hunts are for children 10 and younger, who will be divided into the following age groups: 1 & younger, 2-3, 4-6, 7-10. The family event will have bounce houses, face painting, arts and crafts and a toddler play area. Bring your own baskets to collect eggs filled with candy. The Bunny will be here between 10:00 – 11:00 a.m. Details: Gates open at 3:30 p.m. Generation Church in conjunction with Roger Dean Stadium will host the event where 50,000 eggs with candy, prizes and gifts will be dropped from a helicopter onto the field. There will be face painting, a lemonade stand and a gift bag for every family. After the egg drop, enjoy a baseball game between Jupiter Hammerheads and Dunedin Blue Jays. Bring your own basket. Cost: The event and baseball game are free and tickets for egg drop are available at Generation Church. Details: Doors open at 10 a.m. The egg hunt starts promptly at 10:15 a.m. Kids ages 1 through 10 can hunt for Easter eggs across two acres of palms and natural plants. Kids can also enjoy a lemonade stand and a visit from the Easter Bunny. Details: Call to make a reservation, enjoy all-day admission to the zoo, buffet breakfast with the Easter Bunny, animal encounters and an Easter egg hunt. Starts at 9:15 a.m. for children 12 and under. Free carousel rides! Details: Gates open at 9 a.m., and the Easter egg hunt begins at 10 a.m. Kids can hunt for 8,000 candy-filled eggs on the grounds. Take pictures with the Easter Bunny, engage in Easter-themed craft projects, have their face painted, receive a balloon sculpture, and play the Bean Bag Toss game. Bring your own basket. Details: Enjoy live music and egg hunt between 10 a.m. to 1 p.m. Children ages 1 through 12 can hunt for hundreds of Easter eggs, meet Peter Cottontail, have their faces painted and play in bounce houses. Details: Visit with the Bunny at 8 a.m. Hunt starts at 8:30 a.m. Over 10,000 eggs filled with candy and special prizes are up for grabs at the 25th annual egg hunt. Children ages 1 through 10 are invited to bring their own baskets and participate in the hunt. Details: The egg hunt begins at 10 a.m. Children will be divided into age groups will be divided into four age groups: ages 2 and under; ages 3 to 4; ages 5 to 7; and ages 8 to 10. At each egg hunt, eggs found with a pink bunny ticket inside will earn a special prize.